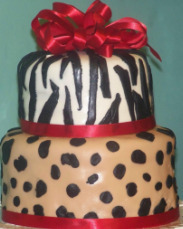 Alicia was kind enough to submit her special Leopard-Zebra sour cream dessert for a roaring finale of any meal! Alicia works full time in an insurance agency and she has just started learning to decorate cakes in the past couple of years. She is hoping to one day decorate cakes full time, doing what she truly loves! For the moment, she shares her beautiful cakes with family and friends. “This cake is made with a 2″ – 6″ and 2 – 10″ round White Almond sour cream cakes. It is iced and filled with butter cream. The fondant is homemade and is tinted to match the invitation. Thank you Alicia and let us know when you need some cake testers!